Sky News reports on the Scottish politician Tavish Scott (real name) as he proposes a ban on maps that use an inset to show Shetland. Utter nonsense. So in that sense it has a rightful place on any map of which any of those jurisdictions is the focus. 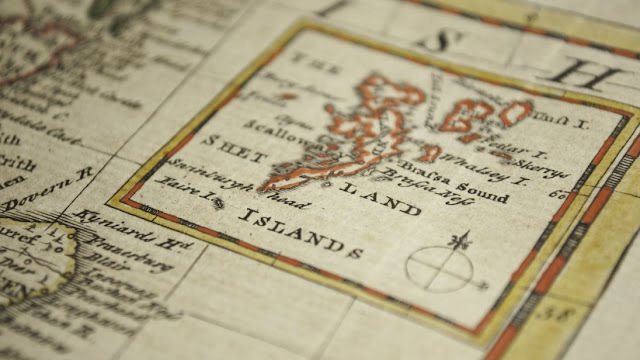 In simple geographical terms Shetland is approximately 130 miles from mainland Scotland though it's also on the same line of latitude as Bergen on the west coast of Norway at a distance of 200 miles. That's where it sits. At a nice northerly 60° 9' 11" N and 1° 8' 58" W. We can argue all you like whether it should be part of Scotland or, perhaps, a bit of waste left over from Slartibartfast's design of the Norwegian coastline but for now, it gets put on maps of Scotland and any other that includes Scotland. And that makes it a pain in the arse for cartographers. By the way, did anyone spot I deleted France from the map above? Guess that'd annoy the French too but whatever, I doubt the scots or Scott cares much about that little cartographic editorial decision. 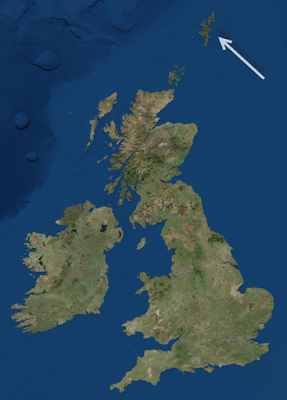 The area outside the yellow line is superfluous to the map as the Republic of Ireland is irrelevant on many maps that show thematic data for Great Britain and Northern Ireland (or UK etc). So as a rough estimate the page only uses approximately 60% of its overall space to show the mapped content. Put another way, we need a fifth of the entire page (above the green line) just to get Shetland on. That's Shetland, population 22,000. Or, in geographical terms, an island that is 566 sq miles which is 8x larger than the City of Glasgow but which has 27x fewer people. So you're making a decision to allow geography to not only influence the design but take an inordinately exaggerated status simply by virtue of position. This fits the map to the paper (not the paper to the map). And there's far less wasteful space. Far less prominence to unpopulated swathes of water. And yet Shetland gets its own little special place on the map, with the addition of a neat border that clearly demarcates it. Often, Shetland is even exaggerated in scale to make the inset worthwhile. I bet you didn't notice but in the example above Shetland is about 25% bigger than it really is. So, if Scott wants Shetland back in its proper geographical location then he can have it reduced back to its real size too. Returning to the City of Glasgow. In fact, any relatively populous place. They suffer horrendously on any maps of thematic data because large areas, perhaps relatively uninhabited or sparsely populated take visual prominence. Scotland is a great example. Its total population is around 5.3 million yet 1 million of them live in Glasgow and Edinburgh. Their population densities are far more than the far greater share of Scottish land, including Shetland. So why give such visual prominence to sparsely populated areas? Insets are not just used to move geographically awkward places. 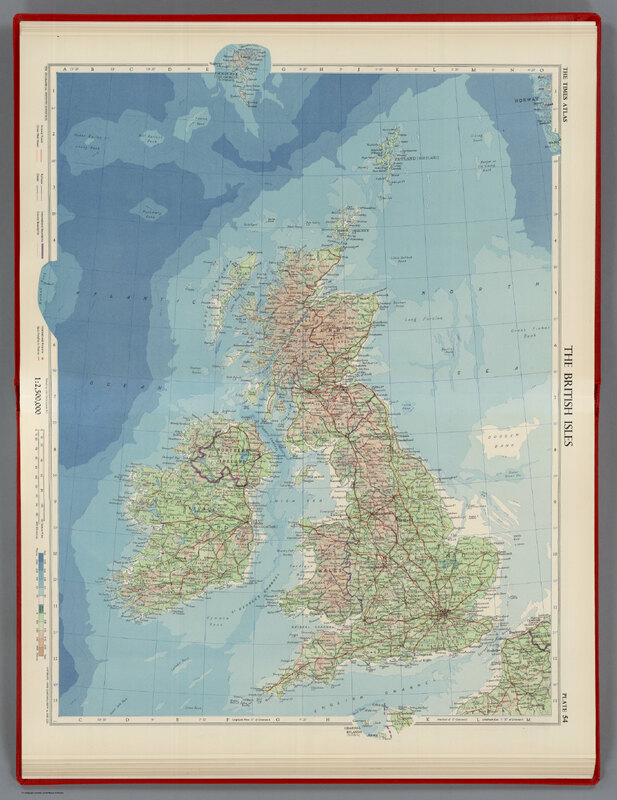 They are commonly used to create larger scale versions of the map for smaller, yet more densely populated places. Often they are positioned over sparsely populated land to use space wisely. I'm guessing Scott would have an objection to an inset that, to his mind, would exaggerate the geographical importance of Glasgow compared to Shetland. Yet...in population terms it's a place of massively greater importance so one could argue it deserves greater relative visual prominence on the map. Many maps are about people, not geography. Whatever your view of insets (and Scott's is incorrect), there's so many valuable uses for them that counter the problems of geography making it awkward to make maps. Generations of cartographers have come up with novel solutions to many, if not all, of these dilemmas about what to show, where and how. And if the map has an overarching location map showing everything in its correct position then there can be absolutely no confusion whatsoever. And what of digital maps? Scott seems to be stuck in the age of print cartography because insets are rarely, if ever, a requirement in digital cartography. Everywhere exists where it is. The map is slippy and you can pan and zoom to your heart's content. Want to see a densely populated area? Zoom right on in. In fact, whisper it quietly in case Scott is listening but...if he uses the standard Web Mercator web map he not only gets Shetland in its rightful position AND it's also exaggerated in size compared to the southerly latitudes of mainland England by virtue of the projection. Now isn't that the map he really wants? As BBC News reports Mr Scott has got his way and a bill has been passed that includes a 'mapping requirement' that Shetland not be placed in a box. Fortunately there's a clause allowing cartographers to use an inset if they have a case to do so...so that's OK then because there's always a case to do so UNLESS you're making a navigational chart where distance, direction and bearings are obviously the paramount need for the map's properties and design to support. But all this really means is time wasted and taxes used up as map-makers submit their case to use an inset for Shetland. So, where do we go from here? If Alaska and Hawaii find out about this nonsense then it's going to make future US maps rather interesting. And please don't get the Falkland Islands worked up and starting to assert their right to be included on maps of the UK. As a British Overseas Territory, they, along with the rest, may very well start insisting they should be on the map, in the correct location. So, here's your updated map Mr Scott. Shetland is in the right place but you can't see it any more because we've had to include all the British Overseas Terretories as well. Sorry about that but they all have an equal right. 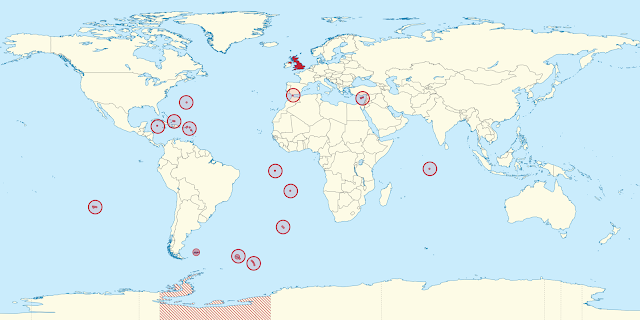 I do hope you appreciate it's a useless map for showing important geographies of the UK though. That's what the new 'mapping requirement' law promotes - bloody ridiculous mapping.